The Recycling Depot is now on SUMMER HOURS (April – September). We are open 7 days a week, Monday – Saturday 8am – 6pm & Sundays & Holidays 9am – 5pm. Winter Hours (open till 5pm Mon-Sat) begin on October 1, 2020. 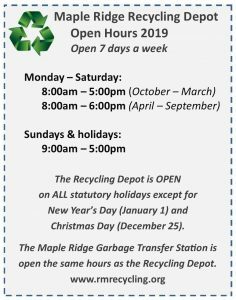 The Maple Ridge Recycling Depot is located just off River Road in the Albion Industrial Park in South-East Maple Ridge. If you remember the old Albion Ferry terminal, we are just west of it! Email: info@rmrecycling.org Click to see our Staff Directory. Looking for garbage drop-off? 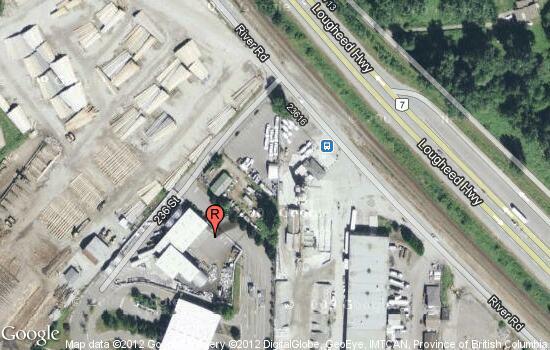 Metro Vancouver’s Transfer Station is located next door to the Recycling Depot at 10092 – 236th Street, Maple Ridge, BC. For more information on the Transfer Station, phone 604-681-5600. Choose from the drop down to more accurately direct your request.